The 2019 NCAA Division I Women's Ice Hockey Championship kicks off this weekend and will feature 120 American players across the eight teams vying for this year's national title. The quarterfinal round will include match-ups between Wisconsin (1) and Syracuse (8), Clarkson (4) and Boston College (5), Minnesota (2) and Princeton (7), and Northeastern (3) and Cornell (6), while the NCAA Frozen Four is set to be held March 22-24 in Hamden, Conn. The tournament semifinals and championship games will air live on the Big Ten Network. For the full schedule, please click here. 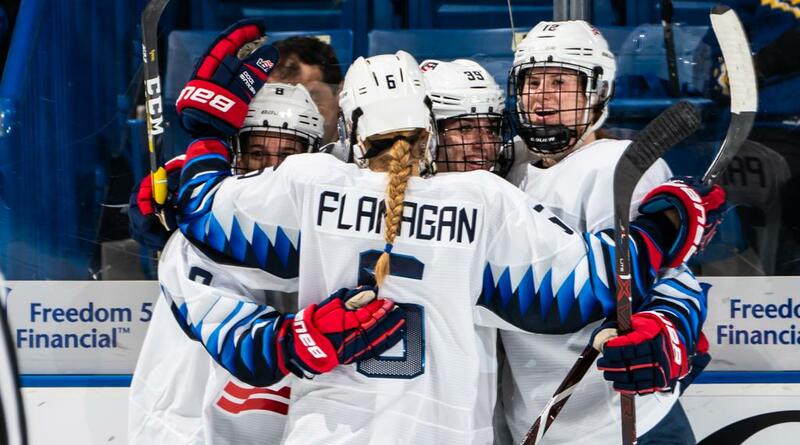 Flanagan celebrated a goal with Pannek and U.S. teammates during the 2018 Four Nations Cup. Four members of the gold medal-winning 2018 U.S. Olympic Women's Ice Hockey Team will put their skills on display, including Cayla Barnes (Eastvale, Calif./Boston College), Kali Flanagan (Burlington, Mass./Boston College), Megan Keller (Farmington Hills, Mich./Boston College) and Kelly Pannek (Plymouth, Minn./University of Minnesota). In addition, Annie Pankowski (Laguna Hills, Calif./University of Wisconsin), a member of the 2017-18 U.S. Women's National Team, will lead the Badgers into the quarterfinals. Among the tournament participants, 38 players have represented the United States in international competition. Of those players, 34 have done so in International Ice Hockey Federation World Championship play -- including the Under-18 Women's World Championship, Women's World Championship and Olympic Winter Games -- and combined to win 65 medals (51 golds, 14 silvers). 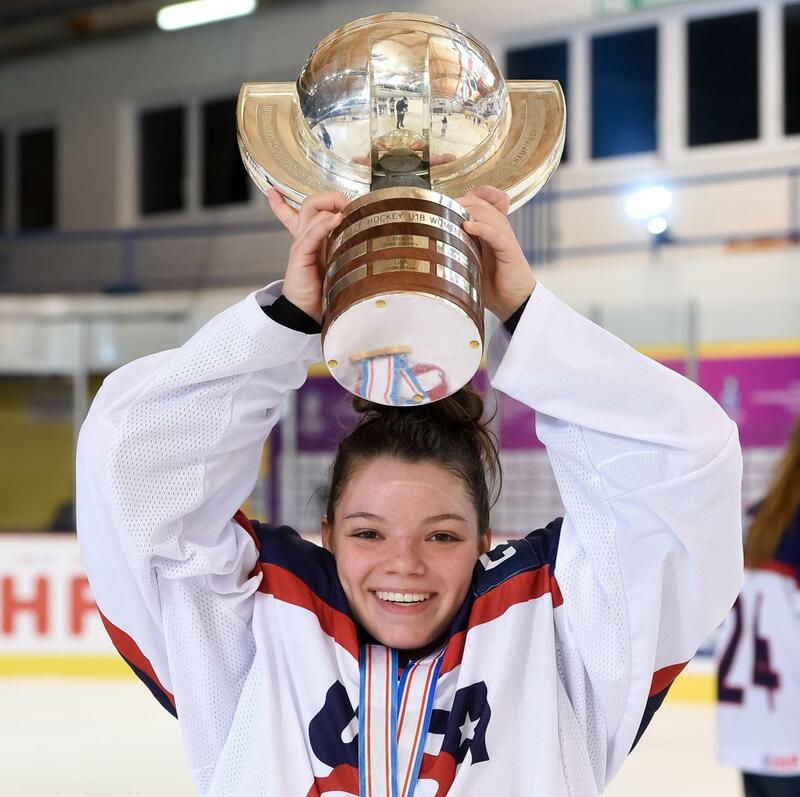 Among the group, three U.S. players are three-time IIHF Under-18 Women's World champions, having won the tournament's top prize in three consecutive years. Barnes was first to reach that milestone, claiming titles in 2015, 2016 and 2017, and was soon followed by Taylor Heise (Lake City, Minn./University of Minnesota) and Gracie Ostertag (Shakopee, Minn./University of Minnesota) who won golds in 2016, 2017 and 2018. Collectively, 22 states will be represented by players in the tournament, including Arizona, California, Connecticut, Florida, Illinois, Iowa, Maryland, Massachusetts, Michigan, Minnesota, Missouri, North Dakota, New Hampshire, New Jersey, New York, Ohio, Pennsylvania, Rhode Island, Virginia, Vermont, Washington and Wisconsin. For the full player breakdown, see the table below. Barnes raised the IIHF Under-18 Women's World Championship trophy. In addition, numerous staff members across the eight competing teams have ties to USA Hockey, highlighted by three Olympians. Mark Johnson, head coach of the University of Wisconsin, was a member of the gold medal-winning 1980 U.S. Olympic Men's Team and also previously served as head coach for the 2010 U.S. Olympic Women's Team that claimed a silver medal in Vancouver, B.C. Additionally, Katie Crowley, head coach, and Courtney Kennedy, associate head coach at Boston College, are both Olympians. Crowley, a three-time Olympian, claimed a gold medal as a member of the 1998 U.S. Olympic Women's Team and picked up silver and bronze medals alongside teammate Kennedy in 2002 and 2006. Joel Johnson, associate head coach at the University of Minnesota, also previously served as head coach of the U.S. Under-18 Women's National Team from 2015-2018, helping the U.S. capture four consecutive gold medals at the IIHF Under-18 Women's World Championship and currently serves as an assistant coach for the U.S. Women's National Team. 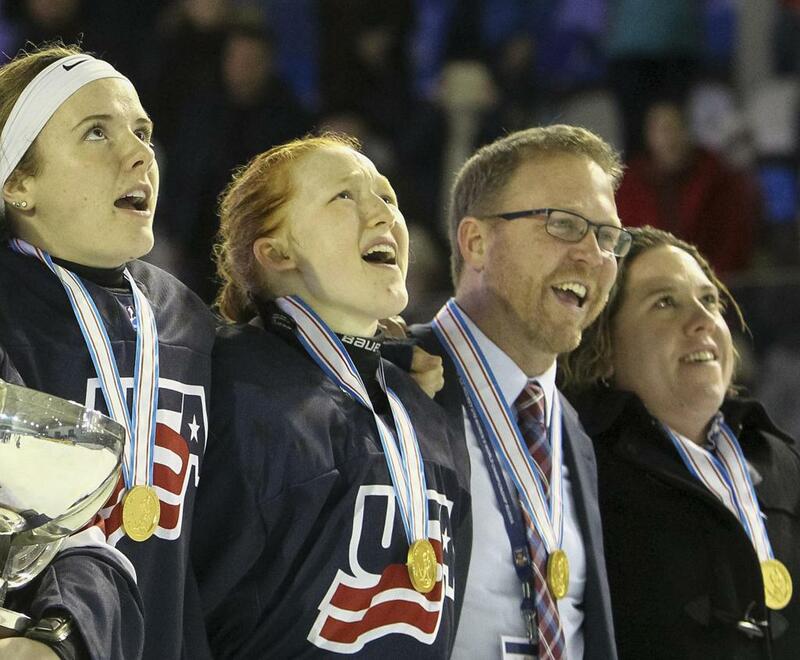 2018 U.S. Under-18 Women's National Team head coach Joel Johnson and assistant coach Courtney Kennedy celebrated gold in Dmitrov, Russia. NOTES: Among the 120 American skaters, two have been named top-three finalists for the 2019 Patty Kazmaier Memorial Award, including Keller and Pankowski. The 2019 Patty Kazmaier Memorial Award will be presented at a brunch ceremony at Cascade Fine Catering in Hamden, Conn., on Saturday, March 23, as part of the NCAA Women's Frozen Four weekend. The ceremony will be televised live on NHL Network beginning at 12:30 p.m. ET. Tickets to the 2019 Patty Kazmaier Memorial Award Ceremony and Brunch can be purchased at PattyKaz.com. Individual seats to the event are $65, while tables of 10 are available for $600.